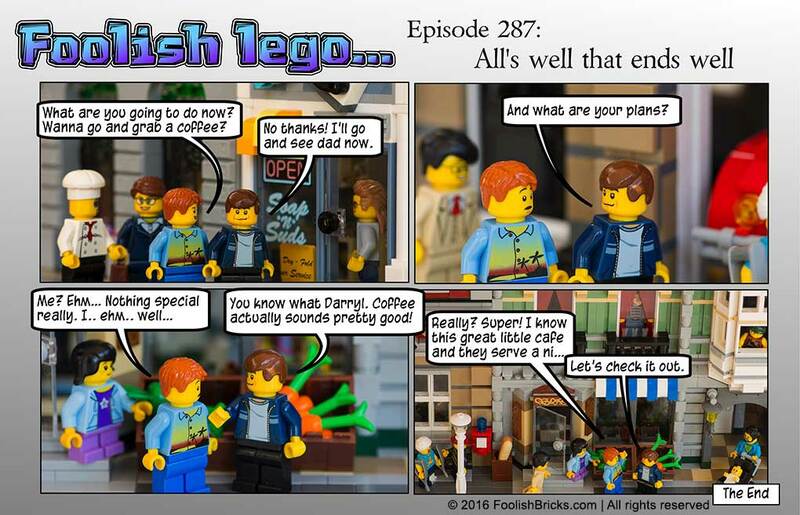 After three years, this is the final episode of the first Foolish Lego comic! I’d like to thank you all for following the adventures of Barry, Darryl and all the other inhabitants of Eno and Lego Prime. Today when I shot the last photo’s it did feel strange, mainly because after the shoot I got to store every character on this website. Nevertheless, I am happy to see the story end. There still are possibilities to go back to Eno in the future… so who knows. First we’ll go and see the adventures of another familiar inhabitant of the Foolish Lego Universe! I am looking forward to it, and I hope be excited about it too. I will need some time to set things up, besides having a vacation coming up. Foolish Lego the Comic (part II) will start within 6-8 weeks! I hope to see you back around that time! In the mean time there will be smaller updates, photo’s, a blogpost maybe… So be sure to check in from time to time. For now, thanks again for following Foolish Lego and enjoy your vacation (if you have one coming up that is 😉 ). I’ll see you all back within a week or six! One of my all time favorite routine is coming to an end… Reading this story every tuesday and saturday really has been a thrill. Original story, great shooting, amazing characters… That’s a huge accomplishement. Congratulations on running this story for so long. Now get some rest, take your time, and come back with a story as good as the one that just ended! That’s a beautiful set to end things off on. Next summer, I’m gonna focus more on trying to make sets like that. Thx, but this time I can’t take credit for the sets…. These are official Lego sets.